During the process to modernize Japanese society, Japan accepted a lot of things from the West. The department store, where they have a variety of specialized stores in one huge building, is one of them. 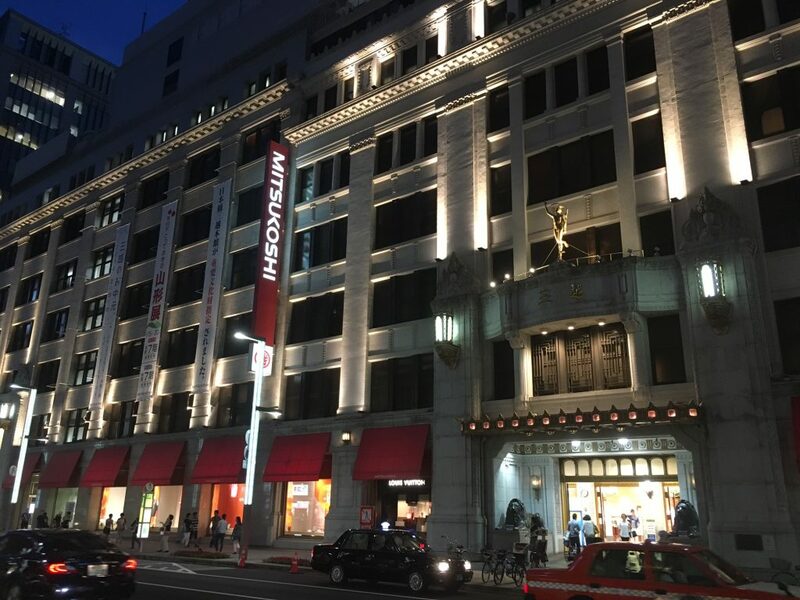 And Mitsukoshi is the first Japanese department store whose flagship store is located in Nihonbashi, Tokyo. In 2016, this building is designated as an important cultural property to show the history of the department store in Japan. The current building itself was built in 1935 as the Renaissance style architecture. And its gorgeous appearance makes visitors feel that the store has whichever luxurious brand they want. But the building is not an only attraction for Mitsubishi Nihonbashi. 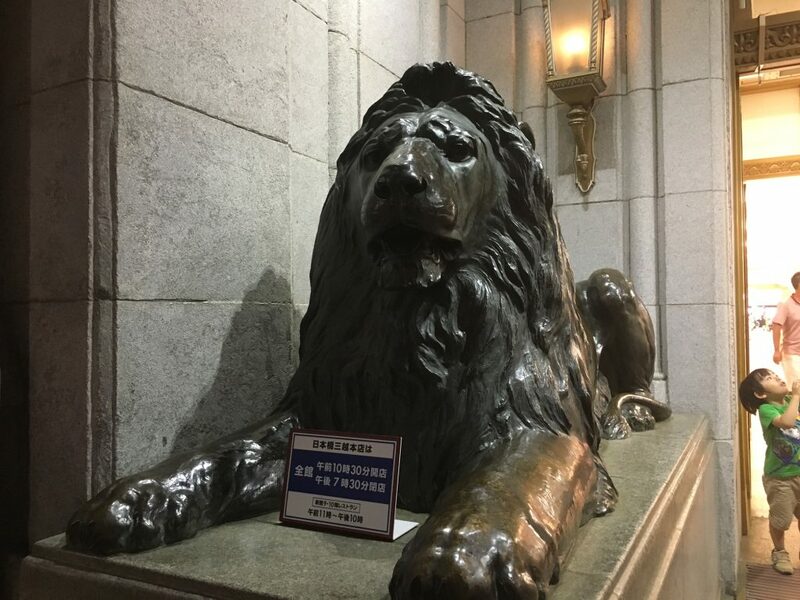 At the main entrance there is a pair of bronze statues of lion. They were reproduced from the lion statues at the Trafalgar Square in London and installed in 1914 at the present location. Such a statue indicates that they tried to make Mitsukoshi as a gorgeous department store like Harrods in London. 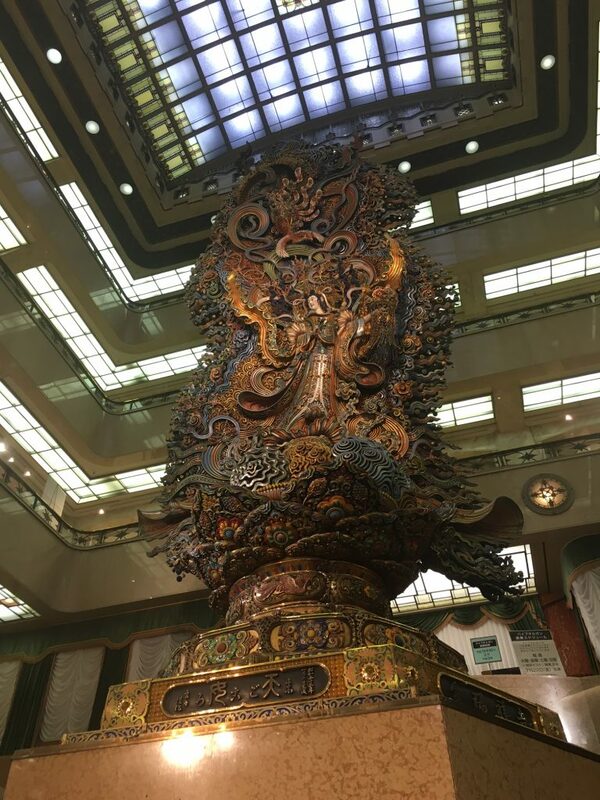 However, when you walk up to the central hall on the first floor, you will find how Mitsukoshi, as the first Japanese department store, tried to show their originality. Then let’s see the central hall. At the first glance you might not be able to recognize what you are seeing at the center of the department store. Then let’s come closer. Now I hope you realized that this is a gigantic and colorful statue of the Japanese goddess. This statue was made by Mr. Gengen Sato, Japanese craftsman in 1960 after spending 10 years to produce it. And it shows the moment when the goddess wrapped with a swirl of clouds has just descended to the flower stem. According to Mitsukoshi, this statue symbolizes their basic philosophy, which is Magokoro (sincerity). And they have been keeping its philosophy in a long time. While Mitsukoshi branded itself as a department store in 1928, its history back to the 17th century. In 1673, Mr. Takatoshi Mitsui, started Echigoy-ya as a kimono shop. In those days, other kimono shops, whose targets were rich people, showed higher prices than their real prices to the customers at first preparing for their request of discount and sold only with the unit of a roll (approx. 10.6 meters). However, Mr. Mitsui showed his sincerity and in order to make his shop approachable for normal people, they showed their real prices from the beginning and sold kimono with the much smaller unit than a roll. 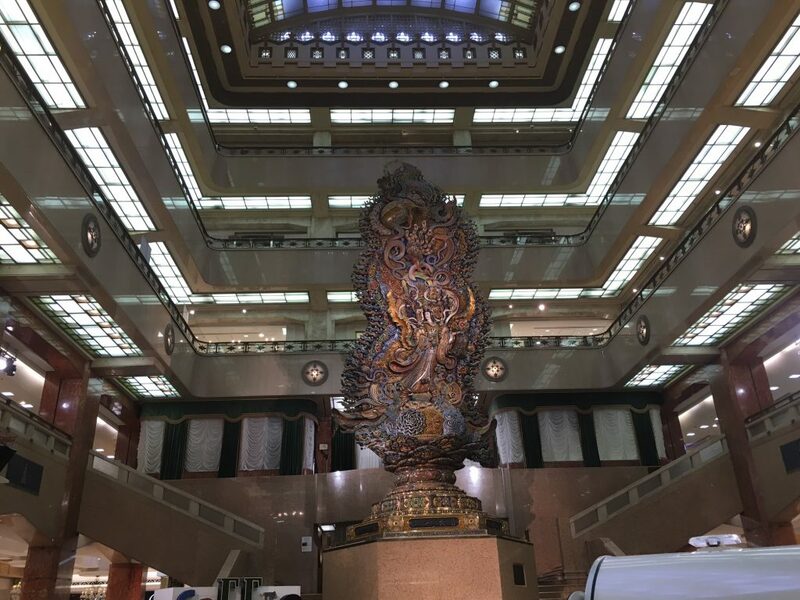 When you visit Mitsukoshi Nihonbashi, you can understand not only a history of Japanese department store but also history of commerce in Japan. Below is the website of Mitsukoshi Nihonbashi.